There's no question, watching the aftermath on major cable networks such as CNN and MSNBC -- and to a lesser extent on Fox News -- Trump's performance was overmatched by Hillary. However, to my mind there was an attempt by most to indicate Donald Trump's first half hour was strong, even "great" according to liberal commentator Van Jones and extended to perhaps an hour by NBC's David Gregory. While I will concede the first several minutes -- perhaps up to fifteen -- showed Trump less onerous than he normally is, the way Jones put it made it appear he got the better of Hillary Clinton. She matched him throughout the debate, even in early moments, so to give him points for not being as awful as he was later on makes it seem Trump whipped Hillary at first. This is important, because Jones stated he thought most people only watched the first twenty or thirty minutes, and with that sort of review he suggested that for them Trump beat Hillary, because they didn't stick around for the part when most felt she destroyed him. I would like to see the numbers to which Jones and others referred, but even with channel switching after watching only a bit Hillary more than held her own. To Trump's charge we have too many trade deals, Hillary reminded our population is only 5% of the world and we have to make trade appealing. She noted Trump got started with a $14 million loan from his very rich father, backed by articles in the New York Times. His jabbing about the TPP was Hillary's only weak moment, because she wouldn't admit being for the TPP, saying she was hoping it was the gold standard, later realizing it wasn't. To his charge she changed her position because of him, she should have retorted, "Donald, there's nothing you've ever said that changed my position. If anything might have influenced me, besides studying the issue more closely, it was through the wise counsel of my good friend Bernie Sanders." That was it. Otherwise, Hillary handled her email issue tersely but effectively, not drawing out her response with an excuse. She simply said she made a mistake and wouldn't do it again. Conversely, when pressed by moderator Lester Holt innumerable times about the "birther" issue he continued to foment, Trump tried lamely to deflect his impropriety by blaming Hillary for starting the smear, an unproven insinuation, as Hillary never publicly did so. Whereas Trump took credit for the president producing his birth certificate in 2011, but never answered why he continued inflaming doubts through January of this year. He dissembled throughout, having few coherent responses, just trying to fill space and hogging airtime, which in my one major criticism of Lester Holt he should have forcefully halted. 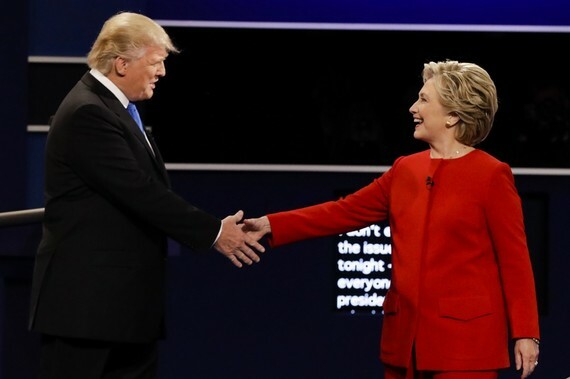 Trump interrupted Hillary continually, and when his minutes were up and asked for more time, he used up loads more than ten seconds Holt promised him, with Holt never threatening to cut off his mic. Perhaps Hillary felt it better to let Donald go on and on, because he was digging his own grave. His interruptions "That makes me smart" regarding not paying taxes, or "That's business" regarding her charge he rooted for the housing bust to profit from the ills of others did him no good. Yet, Chris Matthews and others (including the aforementioned Van Jones) seemed to think that the "birther" issue would end if Trump just apologized. Indeed Jones, after Trump's 39 second press conference admitting Obama's citizenship, said he gave Trump credit for that. Matthews said an apology would similarly put the issue to rest. Excuse me? I would call that expedience. It should not at all end the reality that this man propelled a lie for five years even after it was proven as such by a legal document. Would a man be forgiven after beating his wife for simply not beating her any longer? Why do newspapers and media outlets temper their coverage? Are they dead set on just selling newspapers and building ratings? Yes, most of them ultimately get around to telling the true story, but often with qualifying remarks. Other than saying Trump started reasonably for the first part -- and not even a half hour -- more like fifteen minutes -- the outlets made it appear he had won the first round, when he clearly had not. Hillary matched him mostly point by point and scored deadly ripostes, while doing so in a more polite and dignified manner. Some Trump supporters like CNN's Jeffrey Lord kept trying to change the subject saying there were articles challenging Chester A. Arthur's 1881 citizenship. However, Obama's eligibility was questioned by Trump over five years, even with a birth certificate. Lord also asserted, in a tacit admission Hillary had won, that Reagan and Carter were deemed to have come to a draw in their one debate in 1980, yet Reagan prevailed. The difference was Carter had a dismal economy with sky high interest rates and the hostages in Iran. How can our current situation be compared to that, with the economy so much better than 2008, with crime lower, despite the lies of Trump to the contrary? I am sure Trump will be forced, at least by his children, if not his revolving door campaign managers, to prepare better for the next debate. And he might have more facts and/or know which "facts" not to use as they can be so easily disproved. However, will his penchant for narcissism wane or his incapacity for self-control -- a serious concern for diplomacy and military issues -- be on display? If so, expect more knockouts, which will hopefully be better reported by Mainstream Media.